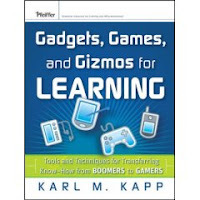 I'd like to thank Karl Kapp for including my blog in his Blog Book Tour for Gadgets, Games and Gizmos for Learning. Karl's book takes a look at members of the "just starting to retire" baby boomer generation - highly skilled individuals who will be taking with them all of their expertise. Simultaneously, a new generation of employee (dubbed by Karl and others as "gamers") is entering the workforce with a different focus and learning style. For the first time, our workplace will experience the invasive influence of video games, Internet surfing, blogging, and podcasting. Karl's personal website is linked here, the book website is linked here and you can purchase his excellent book by following this link to Amazon. In my blog today I take a look at broadband access and availability - critical for gamers and many of the applications Karl discusses in his book. My post is a little different than most that have been posted on the blog tour - I hope it makes sense and you can make the connections to gaming, gamers and Karl's book. One of my passions is what I refer to as the "broadband divide" - basically the broadband "haves" and "have-nots" in the United States. In today's blog I focus on availability in some of the rural parts of my state - the Commonwealth of Massachusetts. Broadband availability and affordability are critical as our online efforts in education (including gaming) move forward - whether it's bandwidth on our campuses or in our student's homes. Residential access is especially important for community colleges since most do not have dorms - students are commuting back and forth from their homes. Let's get into some of the things going on in my state - I think you may find similar scenarios wherever you live. When most people think of Massachusetts the first thing they think of is probably Boston and second maybe the Red Sox or New England Patriots. If you've been to Boston and the surrounding area you know, like any big city and its suburbs, it's relatively congested. The fact that it is congested is good in some ways - typically it's great for things like broadband roll out. Houses are close together with short consistent length driveways. Many of the neighborhoods are older and there are still poles carrying power telephone and cable services. It's relatively easy for providers like Verizon to come into a neighborhood and run a piece of aerial fiber down a street and then add relatively short and consistent length drops to homes on the street. As a result, people in these kinds of neighborhoods (including school kids) have lots of bandwidth available for information, education and entertainment. Those in the more rural parts of Massachusetts (and many other areas in our country) are not so fortunate when it comes to broadband availability. Today, there are 32 towns in rural parts of Massachusetts that have no high-speed Internet, or broadband, access whatsoever. An additional 63 are under-served, with broadband access available in only some areas of the community. Many of these rural town are parts of regional school districts which can present significant problems for students living in these towns. I'll use the beautiful town of Blandford, MA as an example. Blandford is part of a regional school district that services seven towns. Blandford does not have broadband availability (no cable modem or DSL) while others do (although coverage in some of these towns is not complete). Students living in Blandford are at a "broadband disadvantage" when compared to other students that do have access. The main elements of the plan include creating a Massachusetts Broadband Incentive Fund. And the fund will be capitalized by the issuance of a $25 million broadband bond. The fund is proposed to be managed by the Massachusetts Broadband Institute, a division to be created within the Massachusetts Technology Collaborative. Once this management entity is in place, we believe public-private partnership developed here can be extended to under-served regions of the Commonwealth to ensure ongoing broadband equity. The Commonwealth’s approach will be to invest public funds into essential and long-lived broadband infrastructure assets. These include things like fibers, conduits, or towers for wireless broadband services. By investing in these assets, the Commonwealth will lower the overall cost of deployment for private providers. Public-private initiatives have worked in some situations and failed in others - several Municipal WiFi projects come to mind off the top of my head. There have also been some successful wireless initiatives in rural areas including an AT&T implementation in Alaska I blogged about recently. We believe that any individual or community without high-speed Internet access today is educationally and economically disadvantaged, and Governor Patrick tasked us early on to prepare a plan that would bridge the digital divide that faces all too many communities across the Commonwealth. It's great to hear this kind of spirit and ambition and I hope it does not get bogged down in state politics. I do have concerns that $25 million may not be enough to push this to critical mass in Massachusetts. It's a start though - I look forward to the day when all of my students and their families have available and affordable broadband access in their homes. I absolutely agree Gordon, but Stan McGee's talk is cheap considering that the state owns a trunk of fiber running the length of the Pike that is dark. Mr. McGee is a policy wonk, not a technologist, and as such likes the idea of public/private partnerships. The Mass Tech Collaborative fails to deliver time and time again and yet still the state dumps money in its lap. Once again the state will squander essential dollars on wasted "studies" and further research rather than begin the process of implementing state-wide broadband. Additionally, while I agree that $25 million is not enough but where was the pressure from the Western part of the state during the Governor's telecom initiative earlier this year? If we want corporate entities to participate in programs like state-wide broadband or WiFi we need to put pressure on the ISPs to provide it, incentives as well, but pressure must come first. I agree that more needs to be done to give everyone access to broadband. There is a divide and it needs to be a national focus to narrow it. You can't have all of this wonderful technology available and only allow a few to have access, for knowledge transfer to occur both rural and urban environments need access to affordable broadband. Thanks for being a stop on the blog book tour and bringing the issue of broadband access to the table. Too many times, I think we in the field of technology take broadband access for granted. It is always good to remember that not everyone has access. I don't see high speed coming to my home town anytime soon. Not even in 2010 will Blandford see any type of high speed internet. Best we will have is Hughsnet or Wildblue. Granted the idea of a $25mil project is great. People need to remember that Western Mass will be the last part of the state to see any of that money. So the ideas may be ambitious yet lacking in support from the major companies who have to run the supplies and use the equipment to make service in our small towns possible. Blandford has never had cable and most likely will never see it. I would know, I have lived there for half of my life. But the ideas are wonderful and I would love to see them unfold in the near future. If not only for my benefit but also the hundreds of children who live in the towns not serviced with anything but a 46k connection.